This modern funeral spray of fresh flowers has some unusual flowers as well as the more traditional flowers. This makes it suitable for all ages and can be done in different colours and sizes to suit all requirements. Comes with a hand written message for a more personal touch. 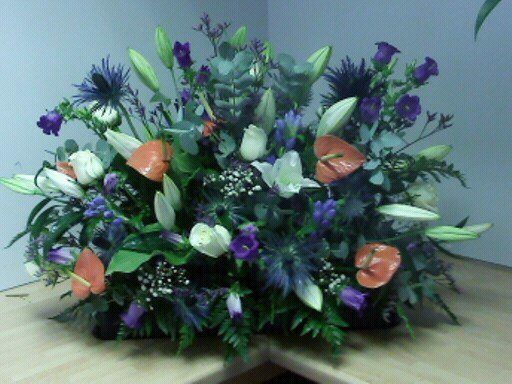 Thistle and Lilly funeral spray. A modern spray with a traditional element. This is suited to all ages. Suitable for a crematorium or cemetery.